I like to eat. I have to eat, as we all do. I want to know where my food comes from. I want my food to be whole good food, not highly processed food. It’s easy to find good food, but I have to be willing to spend a bit more and look a little further than the local mini-mart or mainstream grocery store. In the past 4 months, I have had the joy to taste real food in South Korea, Germany, Greece and Italy with my 14-year-old daughter, Pearl. Why I ended up in these parts of the world is another story, but to explore global food selections is a gastronomic experience. Eating food in Korea is a communal experience. Pearl and I had multiple meals of bibimpap — a mixed rice dish with vegetables — served with an assortment of sides such as kimchee, Korean potato salad, marinated bean sprouts, and spicy cucumbers. We shared meals with our Korean friends, who know how much I love good, fresh food. My favorite dish was shabu shabu, because it was a brand new taste experience for me. Shabu shabu is a Japanese dish that has developed a strong following in Korea. Multiple plates of fresh greens, cabbages, mushrooms, ultra-thin sliced meat, and noodles were brought to our table to cook in our shared hotpot filled with meat broth. Our friend SoYoon knew the exact order to place the food in the pot — vegetables first, followed by the meat and lastly the fresh noodles. As each item cooked, we ladled food into our bowls savoring the flavors. Little did I know that the last step in the shabu shabu experience is cooking an egg in the remaining broth. Pearl and I were full but knew that we had experienced a definitive Korean dining experience. On every trip to Munich to visit my Dad’s cousins (my first time as a 12-year-old), I have picked strawberries. 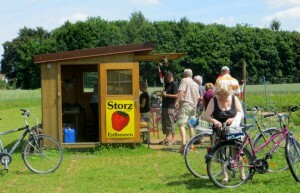 Strawberries are the quintessential summer fruit, and Munich is dotted with multiple strawberry fields just outside the urban boundary. In June, I picked strawberries two different times, with two different cousins, on two different fields within a 10-minute drive of their urban homes. This time we didn’t ride bikes to the fields, so our berries did not become juice! My Dad’s only memory as a 5-year-old on his first trip to Germany in 1939 was picking strawberries. His Mom and cousin rode the streetcar to the strawberry fields. On the way home, Dad spilled his pail of strawberries. Maybe that is why he remembered it — the disappointment of seeing his berries scattered across the streetcar floor. There must be something in my heritage to lead me back to the strawberry field. It’s that burst of sweetness, as I pop a strawberry into my mouth. It’s the warmth on my back as I stoop over the plants to find the largest, reddest, hidden berries. It’s my Dad and his family taking me strawberry picking. It’s making jam with my cousin or adding my own homegrown rhubarb to strawberries at home. Strawberries are my perfect summer fruit, garnering memories of family and flavor. Greece, the ultimate food country. With all the political tension in the news about Greece this spring, about one-third of the international tourists have avoided this center of early civilization. Culminating two years of fundraising Greece provided the best food opportunity for our cash-strapped Girl Scout troop to indulge, because the Greeks were ready to sell to visitors. Just west of Delphi, we were offered the pre-eminent Greek meal at a small restaurant perched adjacent to the Korinthiakos Kolpos, an arm of the Ionian Sea. 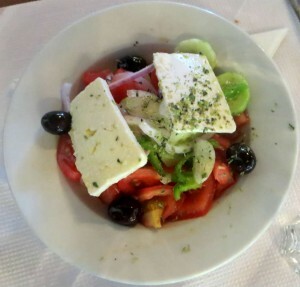 The Greek salad, with cucumbers, tomatoes, green peppers, olives, red onions, and two wedges of feta cheese and just the right amount of olive oil, vinegar, and oregano, tasted like a summer day. The dolmades (rice-and- meat-stuffed grape leaves), the tzatziki (greek yogurt mixed with cucumbers, garlic and dill), and the tiropites (cheese pies) were taste sensations that I had not experienced. I brought home vacuum-packed Kalamata olives, five packets of Greek spices, locally produced olive oil and balsamic vinegar, and a Greek cookbook, to test my ability at this new-found cuisine in my own kitchen. If we would only get a little sun this Seattle summer, I would have my own cucumbers to make tzatziki! Italy knows agriculture. 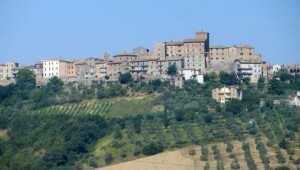 Riding the train through the countryside, fields cover the terrain to the base of the towns located on the hillsides. In a conversation I had with Patty McManus-Huber of Nash’s Organic Produce, she suggested that perhaps one of the differences between European and American agriculture is that Europeans built their cities on the hillsides to see advancing armies coming across the fields, thereby leaving the flatlands for agriculture. Americans founded their cities first as agricultural communities and then expanded our cities onto those same farmlands. Even to this day, according to the American Farmland Trust, the United States continues to lose an acre of farmland a minute to other uses. We need to shift our paradigm and realize the importance of food growing lands, to support our eating habit! In June, Italy is hot and a perfect climate for growing the wonderful summer fruits and vegetables that I thirst for — tomatoes, oranges, peaches, and cucumbers. Each meal is a potpourri of colors — the eggplant antipasti, the roasted red peppers on pizzas, and myriad of greens in the salad. Rather than purchasing a stack of Pringles at the highway rest stop, as many of the Girl Scouts on our trip did, I purchased the ultimate snack pack — a bag of freshly picked oranges — which I ate for the duration of the trip. My oranges were laden with juice and sweet with Italian summer sun. The world knows how to eat! We can get out of the fast food enterprises, the gas station mini-marts, and the center aisles of the grocery store and find a plethora of delectable delights!